In 1870, with the end of the papal rule over the city, Rome became the new capital of Italy. Jews finally regained their civil rights and were free to settle anywhere throughout the city. The Ghetto area was in desperate hygienic conditions, the houses on the river banks needed to be demolished in order to build the embankments. In general the entire area was perceived as a symbol of shame and abasement. The Jewish Community of Rome and the civic administration together agreed to raze the ghetto to the ground. By the end of the 19th century, the demolition was almost completely accomplished. The area of the former ghetto was divided into four blocks and the Great Synagogue was to be built on one of them. The competition organized to build the synagogue was won by an engineer, Vincenzo Costa, and by an architect, Osvaldo Armanni. The first cornerstone was laid in 1901, and the synagogue was inaugurated in 1904. The imposing building is built in eclectic style with Greek and Assyrian architectural motifs. The internal layout is a slightly elongated Greek cross, oriented towards east. A translucent aluminum dome surmounts the entire building. 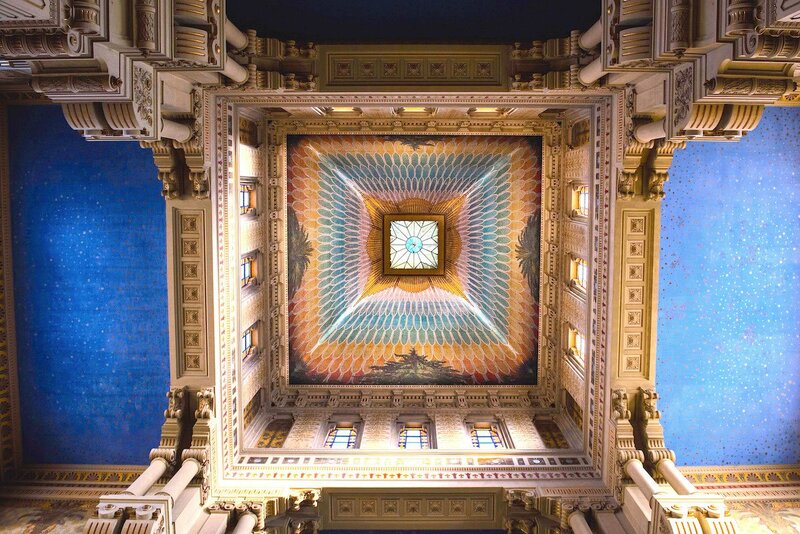 The inside of the synagogue conveys a great monumental effect thanks to the brightly colored geometric and floral decorations on the walls and on the dome by the painters Annibale Brugnoli and Domenico Bruschi and to the stained glass windows by Cesare Picchiarini. The two marble seats on the Bima (the pulpit, called also tevah) and the two arks for the Torah scrolls in the side aisles come from the Cinque Scole: precious artwork made of polychrome marbles from the 16th and 17th century. The building also hosts the offices of the Jewish Community of Rome, the Rabbinical Office, the ritual bath, The Spanish Synagogue, the Historical Archive and the Jewish Museum of Rome. The Sephardic or Spanish rite has been practiced in Rome at least since the arrival of a large number of coreligionists expelled from Spain in 1492. After the demolition of the Scole Catalana and Castigliana, the liturgy was preserved in one synagogue, set up in 1908-1910 in a community building on Lungotevere Sanzio, which no longer exists. 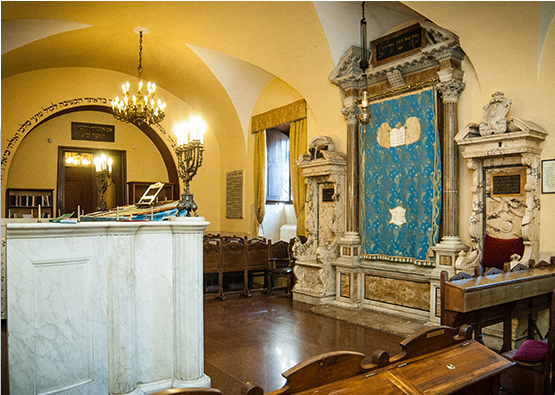 In 1932 the Spanish Synagogue was moved to its current location in the monumental complex of Tempio Maggiore and in 1948 the synagogue was decorated with the marble furniture originally crafted for the Cinque Scole, which conferred to this house of prayer the magnificence and intimate atmosphere of the synagogues in the old ghetto.